Lily in the Sun, ink & watercolor, 5x5"
When I was sketching the lily pond at the cemetery the only camera I had with me was my iPhone. I took a few photos even though I didn’t expect them to come out well (which they didn’t since I was too far away). But I was able to get enough information from them to do two more little studies when I got home of the lilies in sun (above) and in shade (below). 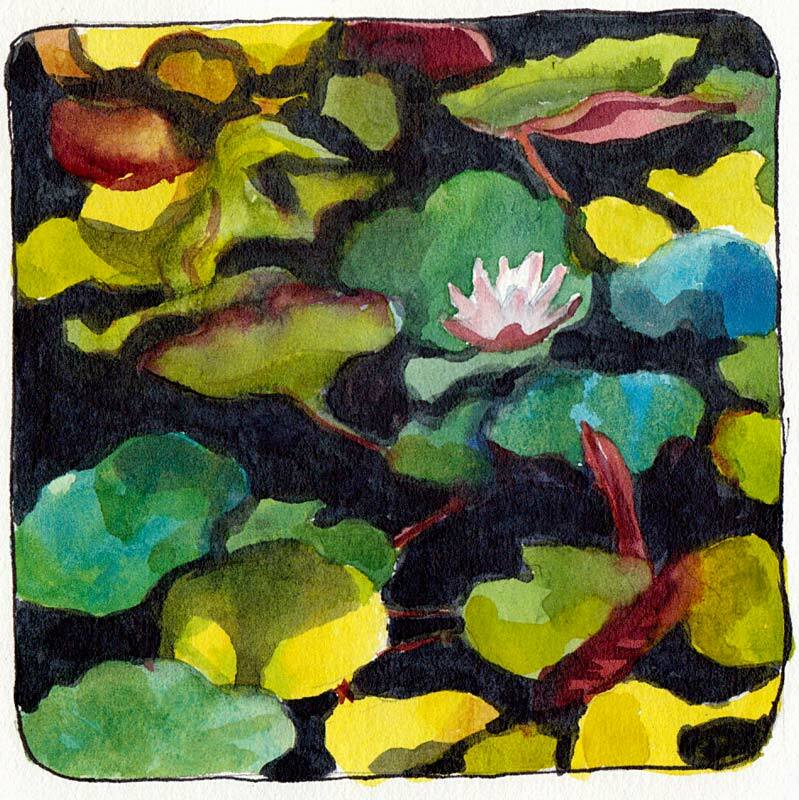 Lily in the Shade, ink & watercolor, 5x5"
Sunday, just one week later, I returned to the cemetery with my good camera, looking forward to taking some good photos from which to paint and continue my water lily investigation. Sadly our recent warm weather had dried up half of the pond. I couldn’t get a single good photo and was uninspired to sketch the tangles that remained. I’m surprised the cemetery owners don’t replenish the water in the pond. Although we’re supposed to conserve water, I know they water the lawns or they’d all be brown since it doesn’t rain in the summer here. What’s a few more gallons to maintain the lovely water lilies? I guess I’ll have to wait until next spring or summer to continue my lily studies unless I can find another lily pond nearby. Love these, Jana. The interlocking shapes really work! Also love the confidence in paint application. I love the way the colors sing to each other in the first one., Jana. Very jewel-like, ..
Nice work! I’m surprised, too, that the pond isn’t maintained! It’s a nice subject to look forward to photographing again once it gets a little wetter. I’m surprised they’d not add water. Maybe they don’t realize how dried up it’s gotten. Hope the koi don’t die, or the water lilies. You’ve done a nice job on rendering them here. This would make some really pretty quilting fabric! Thank you! I love the idea of the lily pics being quilting designs. It would be fun to do a bunch more of them…different views and sections of the scene to make a quilt on paper…that is if they filled the pond back up.. Fortunately there were weren’t any fish in the pond so no critters to worry about. I think I’ll call them and ask why they don’t add water. 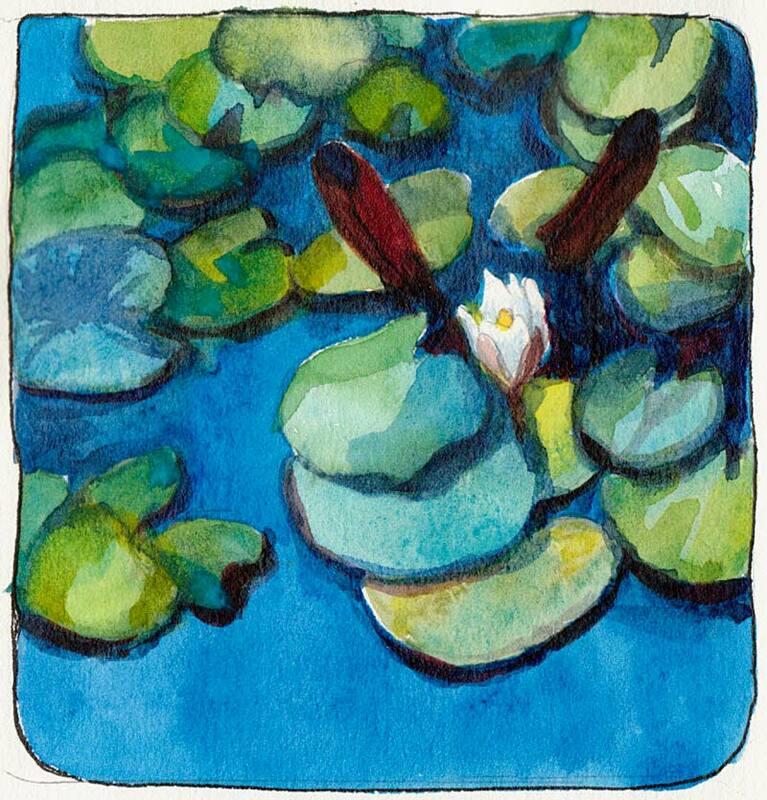 Waterlilies are wonderful to draw – the curved lines, the flat leaves. In Fiji I did lots of drawings of them. You are amazing, the amount of work you do! So what do you do with the paintings afterwards, mount some and sell, or give away to friends or for birthdays etc? Amazing thought of choosing water lilies for the drawing… simply great….